Where To See Nihonto Around The World? Gavin Hougham in the US had compiled the list below a long time ago but the website does not seem to be updated or refreshed. So use as a directional guide and add others such as the Berlin Museum (opened since the publication of the below), some shrines in Japan etc. In Europe there are further places in France, in Italy (Stibbert Museum) etc. Actually, the European information is rather sparse and hopefully we can together on the board collate a more exhaustive list as a future reference. "I sure wish I saw your website before I went." This is a list of places where you can go and see beautiful examples of Japanese craftsmanship developed over, oh, the past thousand years or so in arms and armour. Other sites on the web list not-to-be missed web resources, but this page is intended to give an inclusive list of places where you can actually see artifacts in the flesh. My sources are personal travel, recommendations from others, and bits and pieces culled from the specialist literature and travel guides. I've listed sites separately for Japan and the U.S. Some places are commercial and others are museums large and small where a small entrance fee may be charged. At the larger museums there will generally be English speaking guides or English guidebooks available. Be advised that for some sites visits may be by appointment only and English speaking personnel not always available. Also, just like everywhere else, be prepared for a "cool" reception at commercial establishments until and unless you develop some kind of relationship with them. The reasons should be obvious but I'll mention at least a couple. Swords and armour are first of all weapons of war, and the history behind the artifacts sometimes belies less than simple and forthright admiration for the craftsmanship or beauty of the tool. Be sensitive and show respect for the objects and the history. Second, (and I thank Chris Bowen for this insight) in Japan collecting swords is not so much a middle-class interest as much as it is an occupation of a smaller number of wealthy elite. Most middle-class Japanese I know don't like ANY kind of antiques, let alone ones that have potentially "bad karma" from who knows what kind of battle or mayhem (exactly opposite from thinking of all the honor and pride that went into making these objects). Prices for these art objects in Japan are unbelievably high and beyond most middle-class pocketbooks. As a rule, apart from a few shops that specialize in commerce with non-Japanese, the dealers who traffic in nihonto are used to dealing with collectors who can lay down serious money. That said, I've been in shops with very kind and informative associates, even though the most I spent was an hour of their time cultivating a relationship. This site is very much a work in progress so by all means send me your suggestions of what to see, and corrections to the list. (If I ever get the time I'll add photos, but don't count on it anytime soon.) Names or initials [in brackets] cite much apprreciated source help. Note: Place names in Japan sometimes list the ward (ku), town (machi), city (shi), and prefecture (ken) suffixes as part of the word, sometimes as a hyphenated suffix, and sometimes it is omitted as unecessary. Neighborhood names are used in addresses but these are not identified with a suffix as above, but with a number preceding them. Many sites are linked either directly to that organization or to a local chamber of commerce or tourist information site. Travelers are advised to contact the Japanese National Tourist Organization (JNTO) for current travel information. Here is an abbreviated and highly idiosyncratic list of museums all throughout Japan, but nice for how it groups museums by prefecture. I take NO responsibility for the accuracy or timeliness of this information, nor for the views of organizations listed, which are provided merely as a service to lovers of art and antiquities. LINKS: Rich Stein and Jim Gilbert have excellent, authoritative websites with many links to further information on nihonto (Stein) and tsuba (Gilbert). Highly recommended. Bizen Osafune Museum, Okayama-ken, Osafune-shi. 30 minutes east of Okayama-shi by train, and an hour west of Osaka by shinkansen. The museum is a short walk from the Osafune train station, where maps are posted. "Not a very big museum, but has about 20 blades on display, a display about steel production, a mock-up of a historical swordsmith's smithy, and demonstrations every other weekend." [Han Shan Anderson]. Grant Jenkins has posted some great pictures and additional directions from his recent trips here. Hayashibara Art Museum, (formerly Okayama Art Museum). 2-7-15 Marunouchi, Okayama-shi, Okayama-ken. Phone: (0862) 23-1733. Travel: Tram for Higashiyama, get off at Kencho-dori. Walk east to the corner of the Prefectural office, then left. Museum is through Edo-period gate. Among many other pieces of art, the museum holds two important Bizen school swords, by Kanehira and Masatsune, respectively. Kamakura era swords are by Yoshifusa, Mitsutada, Nagamitsu and Sukeyoshi. Nambokucho and Muromachi armor from Ikeda family. While you are in Okayama, check out the Okayama Prefectural Museum of Art (Phone: 086-272-1149), which has a smaller collection of nihonto, but notable for Heian and Kamakura era swords. Ishikawa Prefectural Art Museum, Dewa-machi, Kanazawa. Phone: 076-231-7580. No guarantee it will be on display when you get there, but they have in their collection Important Cultural Asset (August 29, 1950) tachi by Nagamitsu (Signed), Kamakura period (Late 13th century), owned by Shirayama Hime Shrine (Tsurugi). Izumo Taisha Treasure House, (Izumo Taisha Homotsuden), Izumo Taisha, Taisha-machi, Izumo-shi, Shimane-ken. Phone: (08535) 3-3100. Travel: Try the JR San-in Line or the Ichibata Dentetsu that runs between Matsue and Taisha Machi (about one hour). The Homotsuden is part of a very large, old and important Shinto shrine complex, which, among a large collection of historical artifacts contains a large number of swords because of the steel and sword making tradition of the Izumo area. Kasuga Taisha Treasure House, (Kasuga Taisha Homotsuden). Kasuga Taisha, Kasugano-cho, Nara-shi, Nara-ken. Phone: (0742) 22-7788, or the Nara City Tourist Center (0742) 22-3900. Travel: The shrine complex is in the eastern section of the city at the upper end of Nara Park. A large and important collection of masks, armor, swords and fittings are in this new building built in the traditional kura style just on the edge of the 8th century Kasuga Taisha (Grand) Shinto Shrine. Don't confuse this Kasuga Taisha Shrine with the Kasuga Shrine in Seki city in Gifu prefecture. Seki city is an old center of swordmaking and the Seki brand of cutlery is still produced. Kyoto Arashiyama Art Museum, (Kyoto Arashiyama Bijutsukan). 33-22 Tsukurimichi-cho, Tenryu-ji, Ukyo-ku, Kyoto-shi. Phone: (075) 882-1010. This musuem is said to have moved to Shirahama-shi, in Wakayama. Stand by for update [Oct 2002, thanks Han Shan Anderson]. This museum may have closed [Patrick Howard]. Recent information (April 2002) confirms that this museum seems to have closed in the mid-90s sometime [James Hunt]. Kyoto National Museum, 527 Chayamachi, Higashiyama-ku, Kyoto, Japan 605. Phone: +81-75-541-1151 (from outside Japan), 075-541-1151 (within Japan). Transportation: Via JR or Subway: Get off at Kyoto Station. From bus platform A2 in front of the station, take City Bus #206 or #208 to "Hakubutsukan-Sanjusangendomae" bus stop. One minute walk to the Museum. Via Keihan Railway: Get off at Shichijo Station. Walk east along Shichijo Street (about seven minutes)to the Museum. Via Hankyu Railway: Get off at Kawaramachi Station. Walk east over the bridge to the Keihan Railway Shijo Station. Take Osaka-bound Keihan train to Shichijo Station. Walk east along Shichijo Street (about seven minutes) to the Museum. Free parking on Shichijo Street, east of the Museum entrance. Check out important cultural property tachi (1598) by Umetada Myoju. This piece may or may not be on display at any particular time, but they have many others! Matsushima Kanrantei Museum, 56 Aza Chounai, Matsushima-cho, Miyagi-ken. Phone: (02235) 4-2111. For details contact: Matsuhima Kanko Kyokai, 022-354-2618. A collection of possesions of the Date family. Highlights include armor, horse fittings and spears (yari, naginata). Masamune moved the now adjoining Kanrantei tea house to his Edo (Tokyo) residence during the years 1592 to 1596, and Tadamune moved it to its present location. I am still trying to figure out if this is separate from or merely an old name for the Michinoku Date Masamune History Museum (below). Matto Municipal Museum, (Matto), Kanazawa. Phone: 076-275-8922. The process of producing samurai swords by Sumitani Masamine (a living national treasure) and works of contemporaries in Matto are exhibited. Watanabe Museum, 1-55-1 Tsutsumishita, Kakuji, Tottori-shi, Tottori-ken. Phone: 0857-24-1152. Travel: Take the bus for Sakyu, Iwami or Iwai and get off at "Watanabe Museum" (15 min. ride from Tottori Sta.) "Art from the Heian Era to the Meiji Era (about 800-900 years) is exhibited. 10,000 pieces of calligraphy, pictures, works of art, porcelain, folkcraft, arms and Buddhist altar fittings are worth seeing." For recent photos of some of the arms, see the May/June '98, Vol. 30(3), issue of the JSSUS Newsletter. Aoi Art, 4-22-11 Yoyogi, Shibuya-ku, Tokyo. Phone: 011-81-3-3375-5553; Fax: 011-81-3-3375-5459. Owner Kazushige Tsuruta's web site in English and Japanese is nicely developed and includes many items for sale as well as periodic on-line practice kantei (identification and evaluation) pages. Iidakoendo Co. 3-17-33 Shimoochiai, Shinjuku-ku, Tokyo 161. Phone: 03-3951-3312; Fax: 03-3951-3615. Travel: Mejiro station on Yamanote line. Hours 10am to 6pm except Wednesdays and Holidays. The shop "has been engaged in business for over a century. The present owner is a fourth generation sword expert after its founder started his business during the Meiji period under the name of Katanaya, meaning the Japanese sword shop. 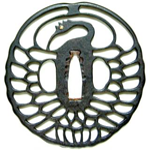 We are experts dealing with Japanese sword, armor, sword-guards and other Japanese sword fittings." Masamune Sword Shop, 25025 Redlands Blvd., Loma Linda, CA, USA 92354 Phone: (909) 799-2080. Fax: (909) 799-2088. Owner Mike Christian. Travel: Drive 2 miles east of the 215 on I-10, then exit Tipacanoe/Anderson, rt, then left on Redlands Blvd (going east again). 1/2 blk on the right, across from Hometown Buffet, White building with a big red stripe down the side and a big katana across the sign, "Swords, bought and sold." The British Museum, Great Russell Street, London WC1B 3DG. Information desk: (+44) 020 7323 8299. Four Underground stations are within walking distance: Holborn, Tottenham Court Road, Russell Square, or Goodge St. Free admission. Swords and armour and other metalwork objects, plus a nice assortment of screens, paintings, and ceramics are on permanent display. Many items are in storage, which may be viewed only by special arrangements. From their website: "Admission to the Department of Japanese Antiquities (study collection) by appointment only: Monday-Friday, 10am-1pm and 2:30-4:30pm. Access via the North Entrance, Montagu Place, WC1. Visitors should go to the Prints and Drawings lobby on Level 4. A written application is normally required naming one referee. For further information, tel: +44 (0)20 7323 8560, or Japanese@thebritishmuseum.ac.uk." They have much of their Japanese arms and armour available for viewing online here. Victoria and Albert Museum, Cromwell Road, South Kensington, London, SW7 2RL. Phone: +44 171 938 8500. Underground Tube station: South Kensington, more or less to the front door. Extensive collection of swords, fittings and armour, much of which is not on show. The Royal Armouries Museum, Armouries Drive (The Waterfront), Leeds LS10 1LT, England. Telephone: 0990 106666. Hours: 10.30 am to 5.30 pm. "The Royal Armouries is Britain's oldest museum, originally established in the Tower of London, it now occupies three sites in Leeds, London and Fort Nelson, Portsmouth." Armour, guns, pole arms, archery equipment and some swords plus loan exhibition of items from Nikko Toshogu that changes periodically. About half on show. Contrary to rumour, Ian Bottomley reports there is no Masamune in the collection. There is a "fabulous set of efu no tachi fittings in the Chinese style," but the blade (and saya) are themselves of dubious quality and authenticity. Snowshill Manor, Gloustershire. 26 armours plus pole arms and some swords. Merseyside Museum, Liverpool. Over 100 swords, armours and a fine collection of tsuba and fittings. Little is normally displayed. Glasgow Museum, Glasgow, Scotland. Mixed collection of armour and swords. Birmingham Museum, Birmingham. Some armour and a few swords, fine collection of tsuba and other fittings. Normally not displayed. Bradford Museums. Three superb armours and about twenty swords and misc items. Only part on show. Chiddingstone Castle. About twelve armours and originally a superb collection of swords but I believe some have been disposed of. The Baur Collection. 8, rue Munier-Romilly, CH 1206 Geneva Phone: (022) 346 17 29; Fax: (022) 789 18 45. Open from 2 p.m. to 6 p.m. except on Mondays. Admission Fees: sfr. 5. The Baur Collections are among the most famous and well published Western collections of Japanese and Chinese art objects. Numbering into many thousands of objects, the collection includes swords and sword fittings of only the rarest beauty and craftsmanship. Almost nothing in South Africa. But there is one museum in Cape Town that has a permanent display of netsuke from the Isaac Kaplan collection that also features some wonderful fittings. No swords. But it is worth visiting for the fittings included, and since entry is like $5, a must see if you are in Cape Town. Good luck with the book, and really looking forward to hearing more about the Yume Collection Ray. Guys this is awesome so far, please keep it going, much appreciated! Boston Museum of Fine Arts (USA) has a great collection; no idea how much of it is usually on display. Sometimes good exhibitions on Japanes subjects. For blades per se a major exhibit in Japan is probably the best opportunity, but for permanent collections I would strongly vote for Kurokawa Institute of Ancient Cultures (wherever it is exhibited at the moment) as the best hands down for full polish great condition money-can't-buy pieces. Fushimi Sadamune can be of the best blades altogether. O-Mishima is interesting if one looks for even older pieces. Toyama private museum is very good, but basically Juyo-money-can-buy range rather than one of a kind meito things. All three are koto places and not too great when it comes to Edo period. But all other museums are probably either exhibit too little on permanent basis or have other issues. Atsuta shrine for example - bad light, can be Muromachi heavy (rotating exhibit). Nearly all western museum collections are just plain bad when it comes to blades. The little book by Kawachi Kunihira (The Art of the Japanese Sword, as taught by the experts) also contains a list of places in the world where you can see Nihonto. Maybe worth checking out. On this page you will find a list of museums that I collected and divided by continent-state, sorted by city table, with their websites, various links (being implemented with the links of the INTK forum discussions highlighted in orange) and addresses. Keiji that's Awesome! Thank you! As for Russia, in addition to THE HERMITAGE (noted above), the STATE MUSEUM OF ORIENTAL ART, Moscow has considerable holdings of Japanese Art. I suggest you inquire, as to what is actually on display, before making a visit.